Every day, our 26,000 alumni make learning come alive for all students as teachers, leaders, researchers, policymakers and advocates. We invite our alumni and friends to stay connected with the College of Education and learn more about our campaign—together, we can reimagine education. Your gift today moves us closer to a world where every child enjoys an outstanding education. Stay connected with the College and alumni who are making a difference in the lives of students across our state, country and world. We believe it's possible to make learning come alive for all students. 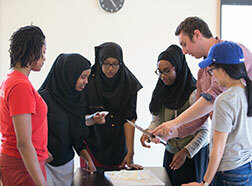 Learn how you can support the College's campaign to reimagine education. Our faculty, students and alumni work every day to address the persistent achievement and opportunity gaps that exist in our schools. 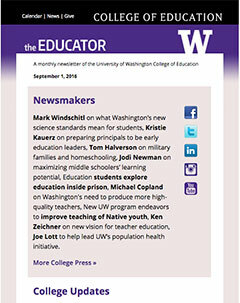 Read the College of Education's monthly newsletter. We believe an effective public education system for a diverse citizenry is the cornerstone of democracy. 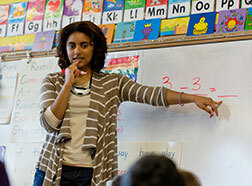 To that end, we dedicate our resources toward making an excellent education a daily reality for every student. There are many ways to support the College’s students, faculty and programs, including online giving and employee matching. Our staff is ready to connect you with the College and its work to make learning come alive for all students.